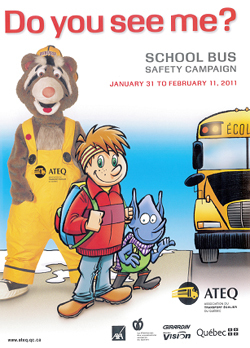 Every year at the end of January, early Febrruary, the Lester B. Pearson School Board actively promotes activities to coincide with the Quebec's Annual School Bus Transportation Safety Campaign. 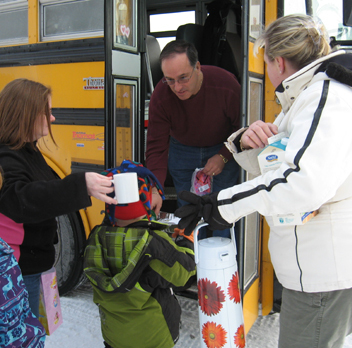 In previous years, Lester B. introduced new and innovative school bus safety programs. At the beginning of each school year until the Christmas Break, Transco, one of our 12 local carriers visits each elementary school to offer a comprehensive animated session to all Kindergarten students. In all, each year, nearly 2,000 students view a safety video followed by a question-and-answer period conducted by a trained Transco driver. Each student receives a coloring book and parents are invited to review, with their children, all proposed school bus safety rules upon reception and throughout the school year. As part of its 2004 review of the Transportation Policy, the Council of Commissioners made these once optional sessions, mandatory for all schools, each year. The school board has always requested that all Kindergarten and Grade 1 students be met by an adult when they are dropped off in the afternoon. As part of the 2010 Provincial School Bus Safety Campaign, the Board’s Student Transportation Services Department, along with the board’s elementary schools and school bus companies implemented the “Purple Equals Parent” program. At the beginning of each school year, a purple tag (luggage-type) is placed at the bottom of the left shoulder strap of bussed kindergarten and grade 1 student’s backpack to help drivers quickly and clearly identify those who must be met at their afternoon bus stop by a parent or their designate. The “Big wheels” Program is a synthesis of Conflict-Resolution, Peer Mediation, Safety Patrollers and Bus monitors; a conflict resolution tool for school bus riders. Judith Grant, coordinator of the Peaceful School Initiatives bought these skills into the school bus environment when she created a Pilot Project at Springdale in 2008. Since then, it has been promoted board wide and several other schools have adopted it since. It is not mandatory. When unsafe behaviors are observed during the bus ride, grade 5 and 6 riding are given tools to intervene The Cycle 3 students who are often the source of disruption are challenged to collectively take ownership and leadership in creating and supporting a climate of peace in the bus. Elementary school administrators, staff and teachers will first be invited to answer questions (on-line survey) about their experience and appreciation of these programs at their schools. Parents will also be asked to comment on these programs. Finally, carriers and drivers will have their opportunity to give us their point of view. It is our hope that this initiative, in itself, will offer proper perspective on how much safer our children are as they participate in these programs and ride the school bus each year.